Anyways, this is a really good roll… the saltiness of the smoked salmon really balances out with the coolness of the cucumber and creaminess of the mayo/imitation crab mix. Delicious! 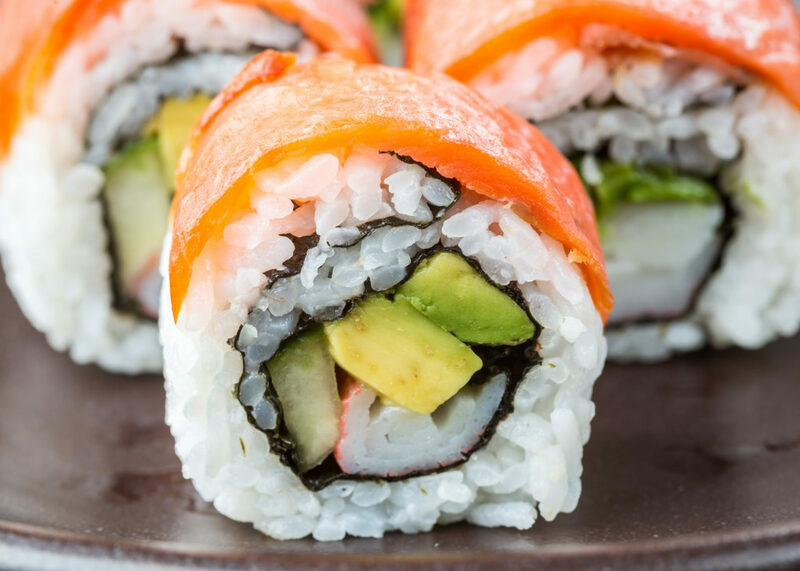 Using avocado sticks, cucumber, and the imitation crab mix as your fillings, roll the sushi inside-out. Place thin strips of smoked salmon across the top of the roll, and squeeze them into the roll with the rolling mat so they stick. Hi yummyyy.. please enter my tummy… I’m ready to lick my screen but I don’t think it’ll taste as good =( God, I love avocado. Sprinkle the smoked salmon with a little lemom juice! Robert-Gilles – Oooh that sounds good! You’re so good at this! You owned a restaurant? Nope never owned a restaurant… I just like making sushi! P.S.- Allison you’re so pretty! Son, you remind me of my older brother, I think thats a good thing you guys are around the same age. 😀 Hehe I’m glad you love sushi… and yeah I agree about the love of rice!